Image courtesy of Venture Outdoors. Starting Friday you can put-in at Kayak Pittsburgh’s newest location at Aspinwall Riverfront Park on the Allegheny River near the Highland Park Bridge. This will be the third location for Kayak Pittsburgh, a project of Venture Outdoors, and will be open Thursdays through Sundays in season. There are currently Kayak Pittsburgh locations on the North Shore under the 6th Street Bridge and in North Park. Site of the new kayak launch – sorry, no swimming allowed! Photo by Maya Tuttle. 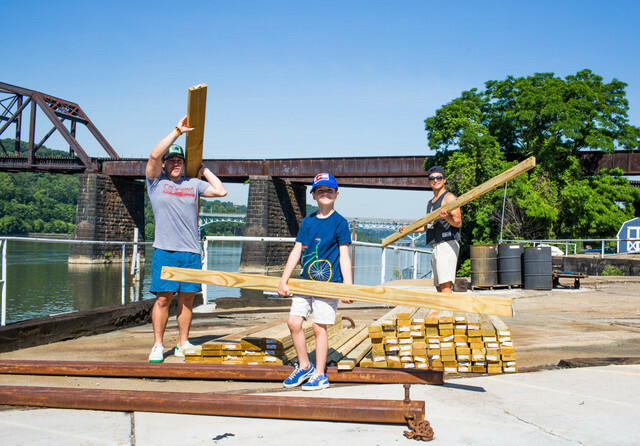 Aspinwall Riverfront Park is an 11-acre community-driven effort to enhance Aspinwall’s riverfront. It began with the formation of the park that is now home to an innovative play sculpture. 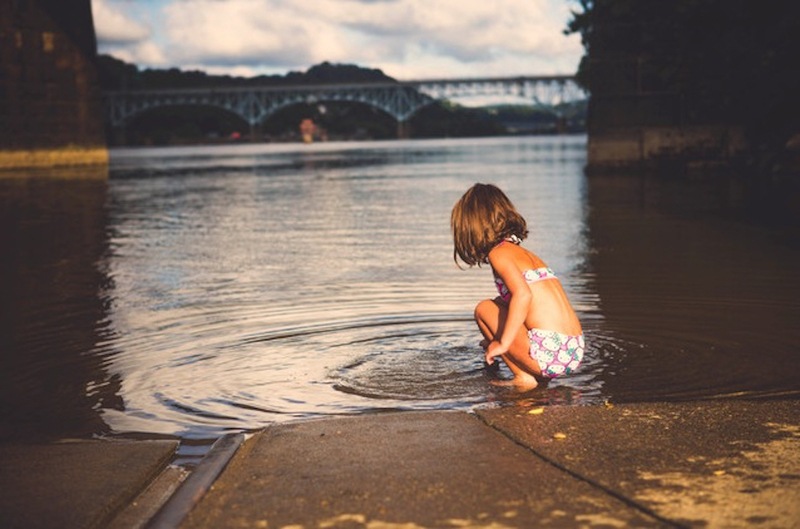 Original plans called for water access and the Aspinwall Riverfront Park Board of Directors, led by Trish Klatt, has spearheaded the effort to add a public boat launch for kayaks and canoes and a fishing pier. Building the new fishing pier is a community affair. Photo by Maya Tuttle. Kayak Pittsburgh’s Aspinwall location will have single and tandem kayaks for rent, which can be reserved in advance. The minimum age to kayak is three years old (or at least 35 pounds) although children under 18 must be accompanied by a parent or guardian. River, or “flat water” kayaking is suitable for any paddler from beginner to advanced. Venture Outdoors’ website compares kayaking to bike riding—depending on the effort you want to expend, it can be strenuous or relaxing. 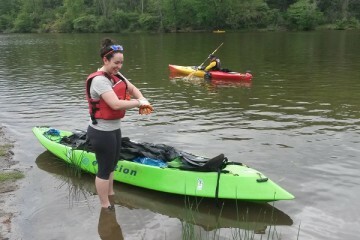 Like Kayak Pittsburgh’s other locations, boats can be taken out for a minimum of one hour during business hours. You do not need to be a member of Venture Outdoors to rent a kayak but members get discounts on rentals and season passes. 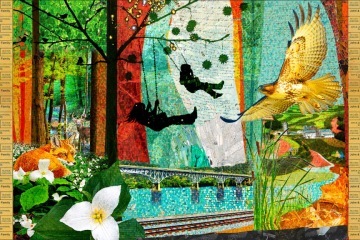 The Aspinwall location will be open on Thursdays and Fridays from 4 to 8 p.m. and Saturdays and Sundays from 10 a.m. to 8 p.m.
Venture Outdoors (which is celebrating its 15th year) is holding a family-friendly kickoff celebration for the Aspinwall location at 285 River Avenue this Friday from 4 to 8 p.m. with free paddling, rock climbing, fishing, and more. 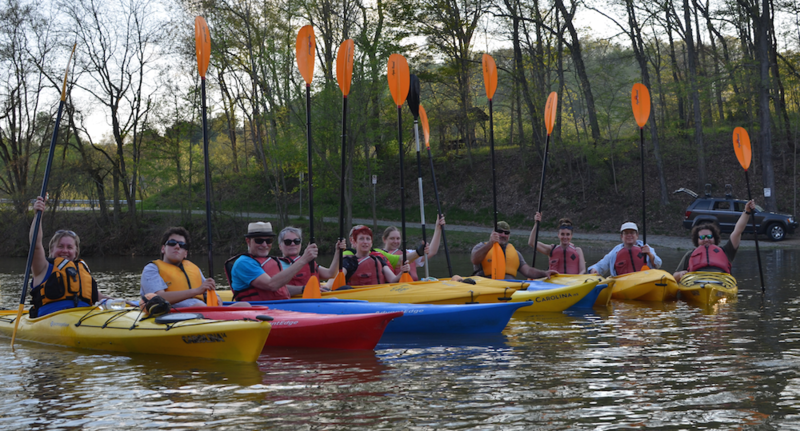 “It’s a great opportunity to come and try out kayaking and see the park. The park is so beautiful it’s a must-see for everyone,” says Ulrich.